Mint Fill My Pod e-liquid is great tasting cool mint salt-based nicotine juice from the Candyman series, made exclusively for use with pod-based devices like the eLeaf iCare, Wismec MyJet, or Juul (and other low output atomizers/mods). Fill My Pod comes in a special 30mL plastic bottle with a needle-nose top to fill pods and small devices easily! These bottles are only 30mL because pod-type devices require a higher nicotine concentration, so 30mL of this liquid will go just as far as 60mL might in a sub-ohm device. Made with love by Liquid Labs in their clean-room facility in NJ. Please note: Fill My Pod e-liquid contains salt-based nicotine. These liquids are specifically meant to be used in pod-based devices and other low-output atomizers/mods. 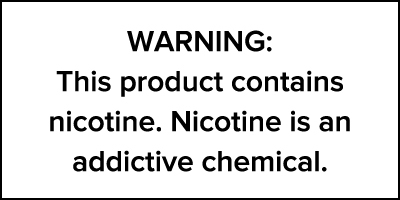 Due to the higher nicotine concentration, these liquids should not be used in sub-ohm devices.